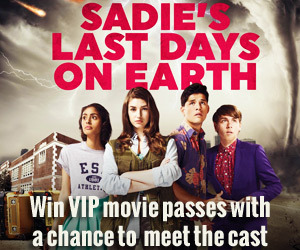 And here’s the video trailer to prove it…welcome to Sadie’s Last Days On Earth. In theatres Friday, Dec 9. Before the world does end, we’d like to toast this new Canadian film about to hit theatres across North America this Friday, December 9th. Written and directed by Michael Seater and co-produced with his biz partner Paula Brancati. Both Michael and Paula are very familiar faces for a generation of teens and twenty-somethings thanks to their starring roles in some very popular Canadian TV series. Michael is probably best known as the star of Life with Derek and 18 to Life, although at Faze we first discovered him as Owen on ReGenesis. Paula was cast regular Jane in Degrassi before jumping over to a starring role in Being Erica. Great to see these talented two teaming up and getting on the other side of the camera! Paula also has a role in the film as do two former Faze cover boys, Munro Chambers and George Stroumboulopoulos, along with Degrassi’s Richard Hoyos. Alberta-raised Morgan Taylor Campbell plays Sadie Collins, whose realization that a possible cataclysmic end to the planet is just a couple weeks away leads to a scramble to get prepared with some survivalist skills, take care of some personal relationships, and live a little. It’s a fun, smart film with humour, heart and everyone’s favourite dramatic backdrop, impending doom. Meanwhile, check this out: You can see the movie on us, and even win a chance to hang out with the cast!